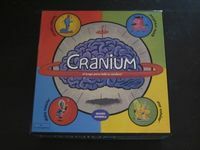 The obejtivo of the game is the Cranium Central enllegar moving around the board in the direction of clockwise and once there you pass a final test team to win. Ideal game to play with friends and in which the team competes. All players will equip your chance to shine humming, whistling, drawing, modeling with clay, acting, deciphering riddles and even spelling words backwards to win.